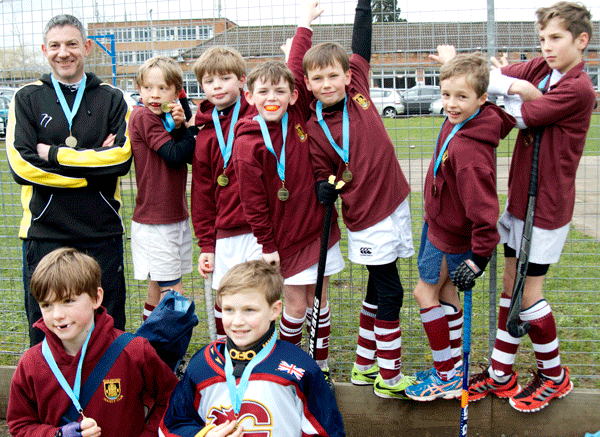 England Hockey's annual In2Hockey Under 10 County Finals were held on Sunday 2 March at Guildford Hockey Club. More than 50 teams from across Surrey came together to compete in a round robin of games leading to play-offs to determine the top performing teams in the County. It was a brilliant opportunity for these young players to focus this season’s learning in a series of competitive matches. Many of the players will only have started playing hockey a few months ago and the progress that all players and teams across the county have made in that time is impressive. The Under 10 Boys took centre stage in the morning, with the top nine teams taking part in the more competitive ‘Surrey Cup,’ playing for the county title. Two teams from each of the two pools would get to semi-finals for the chance at the final. The Guildford A team came top of their pool comfortably, with convincing wins over Woking (5-0), Old Kingstonians (2-0) and Spencer (3-0). In the other pool, Guildford B narrowly missed out on a semi-final place, with Barnes and local rivals Surbiton going through. In the first semi-final, Surbiton edged past Old Kingstonians 2-0, whilst Guildford had a purple patch which saw them overcome Barnes 9-0 in the 15 minutes. The final was also a one-sided affair with Guildford winning 6-0 when the final whistle was blown a few minutes prematurely. In the Guildford A team’s five games of 15 minutes each, Guildford scored 25 goals, our goalkeeper Sean Hope only touched the ball twice, and the opposition did not manage a single shot on goal. 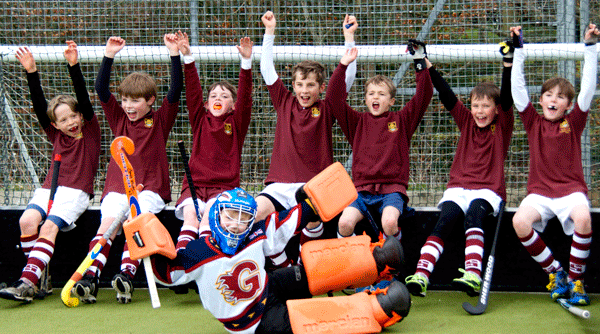 Surrey County Champions: a deserved title for a very strong performance from the Guildford Under 10 Boys. The Girls took over in the afternoon in a similar set-up of two pools leading to semi-finals and a final. 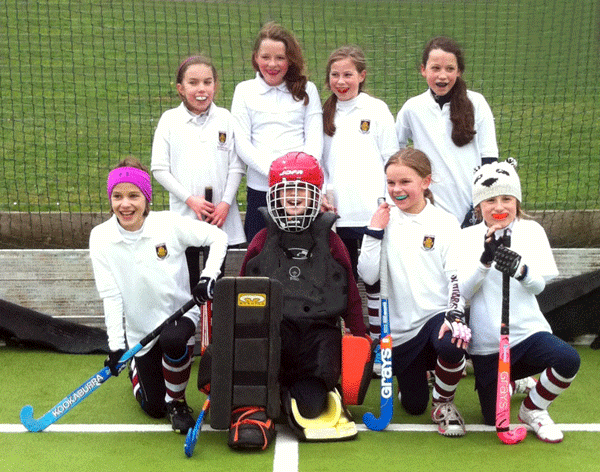 Guildford’s Girls’ A team had a strong start, their first match ending in a close 1-1 draw against Surbiton’s A team. And then the girls did very well to win all three of their remaining group games 4-0. The 4-0 trend for Guildford continued into their semi-final where they beat a strong Woking team. Fortune didn’t see them through to the same score in the final and despite losing to a strong Surbiton team, the Guildford girls go through to the South Regional Finals as Surrey County Runners-Up. And so, Guildford Hockey Club had a fantastic day of opening their doors and pitches to hundreds of hockey players and their parents and coaches to host the tournament. And of course they are thrilled, having earned Gold and Silver today, to have both their Boys and Girls going on to compete in the final England Hockey Under 10 tournament of this season, the South Region Finals to be held later this month. Guildford Coach Sean Cook summarised the day by saying…"I have never seen the clubhouse so busy and it was fantastic to see so many Under 10s from across the county enjoying their hockey throughout the day. With over 70 players in the Under 10 age group, Guildford has amazing strength in depth and this is reflected in the results today. In particular, the Boys' results speak for themselves, and we will work hard to secure further success in regional tournament in a few weeks' time." Just a word of thanks to those of you, on behalf of Surrey HA, who helped us today put on the u10 event. Especially Andrew and his crew at Guildford HC, Josephine, Bill and Maria Carr and all those who helped with umpiring, timing and cooking! To be honest, accommodating 51 teams was a bit of a squeeze and probably some kind of record, so we will split this event next year but thanks for your patience this year. Congratulations to the winners, and good luck to those who have progressed to the regional rounds where they will undoubtedly do Surrey proud by winning them (again)!